Details Product prices and availability are accurate as of the date/time indicated and are subject to change. Any price and availability information displayed on AMAZON.COM at the time of purchase will apply to the purchase of this product. 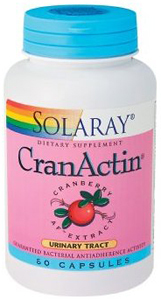 CranActin Cranberry AF Extract is the leading cranberry supplement. It is the first cranberry supplement to be tested and guaranteed to contain the cranberry's antiadherance activity. Fortified with Vitamin C. For urinary tract. If you're one of the people who drink cranberry juice cocktail you may want to consider the following. Some people may not realize that cranberry juice cocktail is not a concentration. Actually it is just the opposite: a dilution. Typically 70 to 75 percent of the cocktail is added water and sweetener. And cranberry juice is mostly water even before the juice is diluted into a cocktail. It's no wonder that some people will drink large amounts of cocktail just to get the desired benefits. And that can add a lot of calories to the diet. Ingredients: Gelatin (capsule), magnesium oxide, cellulose, magnesium stearate, vegetable juice, silica. Suggested Use: As a dietary supplement take 1 capsule with a glass of water two to four times throughout the day. Use every day to help maintain a normal healthy urinary tract.